A refreshingly modern old-fashioned Ice Cream Parlor and Candy Shop. 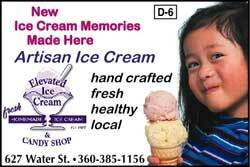 We make our own ice cream, sherbet, and Italian ices (non-dairy) on the premises, and our product selection also includes home baked desserts, espresso beverages, chocolates and specialty candies. The candy shop is adjacent to the ice cream parlor and has a spectacular collection of chocolate and more. “Elevated” (as the locals like to call us) is a family oriented business which emphasizes products of the highest quality, exceptional service, and an enjoyable environment. We hope you’ll plan to join us soon for dessert, a special occasion, or to find that special gift. We look forward to serving you!